!! OMG, how divisive: Gay Generation Gap !! Are the young gays way too placid about about gay rights and the hurtles that are left to jump? Or is there simply just not a need for the queer activism of the past because things seem to be going our way now? Is this freedom enjoyed by the next generation of gays what Stonewallers were fighting for, or was the next generation supposed to become stronger warriors? And here’s the awful stuff they throw back at us–at 45, I write the word “us” from the graying side of the divide–a completely vicious slander (except that some of us are a little like this): We’re terminally depressed. We’re horrible scolds. We gas on about AIDS the way our parents or grandparents couldn’t stop talking about World War II. We act like we invented political action, and think the only way to accomplish something is by expressions of fury. We say we want change, but really what we want is to get off on our own victimhood. We’re made uncomfortable, or even jealous, by their easygoing confidence. We’re grim, prim, strident, self-ghettoizing, doctrinaire bores who think that if you’re not gloomy, you’re not worth taking seriously. Also, we’re probably cruising them. 5 Comments on "OMG, how divisive: Gay Generation Gap"
I’m glad this was written, and further that it was posted here. I am 22, young enough to not be put in with the graying individuals described here, but also well aware that the things they say are often true. I have grown up as an activist for gay rights, throughout highschool and into college I upheld my agenda to do good in some way. Entering into later years of college I have come to realize to a great extent that the rights I fight for are only my own. As far as my peers, a great deal of them at times were so obviously not into having rights, but only exploiting them for their own means. The college GSA became an atmosphere of “How many people here can I hook up with?” and less “Let’s all do something for ourselves and fight for something of our own for once.”. Knowing this, I am smart enough to know that these older gentlemen are not simply talking about everyone, but just in general, and therefor I place a great deal of importance in an article like this. That being said…none of the people who would really be affected by this article in a good way are going to get to it in the Washington Post as I’m sure most of them don’t read more than 6 digit cell phone numbers they get nightly. I’m a young gay guy who has participated in multiple gay rights orginazations and is educated in and respectful towards the movements before my time. While I agree there is an extremely irritating sense of entitlement in my generation, it must be said that this has nothing to do with being gay. This generation worships Paris Hilton and The Hills. It’s a disgusting fad which has nothing to do with homosexuality. Furthermore, to stereotype my gen as slutty is ridiculous. There are times I feel like the only gay on earth who won’t bend over within five minutes of meeting someone. This has little to do with age, although I’m sure my peers use it as justification. It’s not as if the older generation wasn’t young once and doing the same things. Lest I remind anyone of the bathhouses being a breeding ground for AIDS in the 80s. My point is, stereotypes may ring true of many buy there are always those–like me–who fall through the cracks and are falsely accused. Maybe the pot should ignore the kettle and work on self improvement. why is anyone surprised with the generation gap. it has nothing to do with being gay, it has everything do with being older and younger. older people never respect the younger generation and younger people never respect the older generation. we all get to play both parts. we should accept it, laugh about it and move on, its not dividing the gay community, it is just proof that gay or straight we all share common experiences of being young and then being old. lets celebrate it and not debate it. I don’t want to sound snide, but just the fact that he wrote this article reinforces the stereotypes that some gay youth have of older homosexuals. I for one do not act how the article states, I’ve been to several protests and marches and participate with the gay community as much as possible(I do work for college money). I am a firm believer that you act however you want to act, at any age. My parents are pushing 50, and they still act like they are in their 20’s. I have dated older men in the past with no regard to their age, and trust me when I say that I understand where they came from and what they had to suffer in the past. It is true that the gay youth is much more secure with themselves in public then the “older” gays, but thats not something to complain about. And I’m sure that my generation and the next gen will continue to fight for their rights. Just because we are comfortable does not mean we won’t fight for equality. Probably a fair assessment; but not all gay youth are like that. At least I’m not. 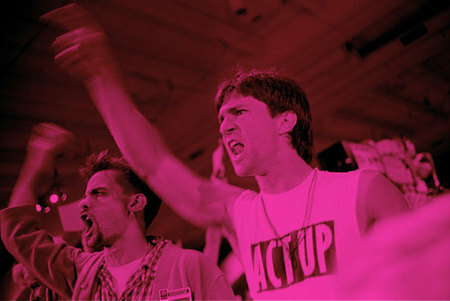 This past generation of gays have been more active and more productive than any before it. I think, that once the younger generation grows older, the true leaders will be seen… and they’re not at all like the people the article describes. I, for one, am eternally grateful for everything that has been done for the sake of my generation… and we’re not even the sons and daughters. We’re brothers and sisters. That’s inspiring.